The fatigue on both maps is exactly the same. In NSD-land the ground does not dry. Congratulations to all the players of yesterday’s battle, even when the AI still has its shortcomings (mainly lack of coordination between arms and units) it is much better than before. French casualties 16,956 ; Russian casualties 10,380 ; but I believe there only remained some battleworthy French battalions of infantry and the guard chasseurs a cheval plus some batteries. It was not easy to crush an enemy with better infantry and cavalry, and the Russian guns played a critical role as expected beforehand. The AI’s artillery is much better handed, and for the best part of the battle their fire over the ridge where most of the battle took place was very telling. Finally, I was under the impression that the objective was safe, even when General'nyy leutenant Kevin Gallitzin had been more that 30 minutes whispering to me “Do you think they can keep it? I just see French flags moving west”. We could have switched some forces to the south leaving Kevin (who was eager to sacrifice himself for Mother Russia) and Mark (who can delay the French for a whole day) to give ground in the north. Well, Roland could easily have held the objective but various panicky bleatings from the east convinced me that l'Entire Grande Armee was coming at our left flank. If we had been told it was only a half-dozen tired battalions we'd have hung on to get the win but by then our C-in-C and the pusillanimous General Gallitsin were half way to Brussels, shouting "The French are coming! Save me first then save yourselves! And give me your tableware while you're at it!" As I mentioned in TS after the battle, it was like Wellington after winning at Quatre Bras. "Blucher has taken a beating and gone back, so we must go back too". A shameful day for the proud Russian army. That makes sense. I hadn't noticed fatigue falling so fast in any of the other games I played with you guys. I'm sure the French were even more tired than we were. Why? I just sent a message to you; “We’re pulling back. Watch your left”. The verdict of history will be as follows; while General'nyy Gallitzin with each an infantry and a cavalry brigade plus his two divisional batteries was holding the left like a lion against a full French division, 70% of Russian infantry supported by an additional brigade from Gallitzin’s division, 45% of their cavalry and half their guns could not defeat decisively the two French divisions holding the center and left of their position. In addition the author, Leontiy Bennigsen, is a favorite at the court. I see tree counting in Siberia in the futures of the other divisional commanders. Well. . . "supported by an additional brigade from Gallitzin’s division" is hardly accurate. I was ordered to connect to Digby's left and anchor our position at Goumont. And that's exactly what I did. "Holding the left like a lion against a full French division." More like two full French divisions. When the hordes came for Kevin, the best I could for him was to anchor his right and keep the French from getting between us. I pulled back to the high ground behind town just in time. Another five minutes trying to hold and my brigade (a whole six battalions) would have been destroyed. Kevin and I maintained cohesion the entire fight. I knew he was in trouble but was too busy to see much of it. My only regret is that I was not perched high on a ridgeline in perfect drill order watching Kevin struggle and sending him couriers warning him of impending doom. I was being humorous. I'd hoped my smiley and over exaggerated language conveyed that but obviously not! Even so, Roland would easily have taken the objective if we hadn't had to fall back. In fact when he began his retreat he'd already captured it. Staying exposed out there with an unknown French force apparently taking Goumont woods to my immediate left I had no option of staying where I was and if I fell back I was compelled out of courtesy to tell Roland, so back he went as well. I think we all know that part of the fun of HITS is that no-one (sometimes not even the C-in-C) has a complete picture of what is going on and frequently an enemy brigade can seem like a division and vice-versa. As we've seen before the sending (or interception) of a single message can win or lose you the battle. We usually don't decide victory or defeat based just on holding the objective at the last minute of the battle, so that's not the important point for me. I didn't grasp everything on TS. But was still wondering why I wasn't informmed that the objective was abandonned when I previously got a report of its capture. About pulling back or moving a division I believe it should be the CinC's decision if not why we have one? "supported by an additional brigade from Gallitzin’s division" is hardly accurate. Up to that point Mark's brigade was hardly engaged with the 2 divisions of the French right wing. It must be said that the left wing had 8 more battalions and 2 more squadrons that the right wing. I don't know actual numbers. as for the rest: I quite agree - holding the objective counts for very little in such a situation - had we played on I believe we would have routed the enemy. Looking at the map Pepe posted, it's likely Roland's couriers were intercepted. Pepe - you as C-in-C sent me a messenger saying "the left/we are going back" (paraphrased). I could not do anything with that information other than assume it now meant my left flank was in the air and needed to go back as well. Within 10 minutes the French had taken Goumont which was anchoring my flank and Mike's brigade that was holding my left had wet powder and had been unable to fire a single shot all day. He was down 1250 casualties and had endured the defence of my ridge for a long time without being able to respond and harm the enemy in any way. The French had been stopped on our ridge by my 24 guns and 5 squadrons. Now, with Goumont lost, Mark falling back to the western end of Wellington's ridge, a gap opening up between me and the Russian left and Mike's men at breaking point, I HAD to withdraw to conform to the new position. Your message was that authorisation - or why send it? With no further messages from you for the rest of the action and Roland already complaining he'd had no comms from you either I felt it my duty to inform him I was going back to my starting ridge further N. He then fell back on my right to conform, abandoning the objective. You can't say post-facto that "unless I give a direct order then don't abandon an objective", you must set these C-in-C's standing orders in place before a battle. It must be said that the left wing had 8 more battalions and 2 more squadrons that the right wing. Mike's 6 battalions were useless except as a delaying force. They had 0 firepower due to a bug. We had spoken about this a few times over TS during the game. I am pretty sure we almost always count holding the objective as the primary victory condition and do not count casualties or points. Why else do we have them? The objective has to have value and it has to have value within the 3 hour time frame of the game - we sometimes are given information about what the objective represents but often not, but it is necessary to the logic of our games to include its control by one side as a victory criteria. In this case even though their corps was largely destroyed, the French won because they held the objective. I disagree with you Roland that one can say things after a game like "if it had gone on 15 more minutes we'd have won" because using that logic you can argue a win for yourself no matter what the result. The result must apply within the time frame of the game and the two armies positions when the timer runs out. You can't do otherwise and be objective about things. I didn't really want to get into this discussion - my earlier post was merely a joke throw away comment for fun but now people are raising some interesting issues that will benefit us all if we address them. Judging from the replay, I'd say very few messages could get through between Pepe and Roland. The enemy was between the two. Maybe the courier AI can be adjusted to not commit suicide. I'll try something and add it to the new version of the mod. It should be up tomorrow. I've seen couriers take the roads sometimes and other times go direct. Isn't distance to recipient the controlling factor there? I'm in favour if keeping the risk to couriers as we now have them, its one factor that makes interior lines a bigger bonus as well as making an attack of encirclement risky. Iberalc wrote: I didn't grasp everything on TS. But was still wondering why I wasn't informmed that the objective was abandoned when I previously got a report of its capture. This may be an example of chain of command confusion between Roland and myself. At the time Roland ordered me to fall back to a position on his right flank and abandon the objective, the French were pushing very hard. We especially had no answer for their excellent, aggressive cavalry and French guns were taking a horrific toll among my battalions. Nevertheless, I held a position at the objective until very late and would have been able to hold on perhaps another 10-15 minutes. I thought perhaps the ordered retrograde movement was a temporary measure to regroup and counter-attack with reinforcements heading our way. On the other hand, if none were actually forthcoming, I would certainly have been pushed off the VP -- so the question of VP possession may be somewhat academic. But to the point about communications: As you know I was detached to the support of Roland's division fairly early in the battle. At first I sent redundant couriers to Pepe & Roland making sure both knew what I was up to. After a bit, however, I slipped more completely into the role of a brigade C.O. in Roland's division, and discontinued sending separate messages to Pepe as CinC. Perhaps I should have at least sent periodic updates to my original parent division C.O. (a role also aptly played by Pepe, our fearless CinC). I think there may also be confusion (and even difference of opinion) about the importance of objectives in our scenarios. Unless stated otherwise, I would tend to think he who holds the single vp at the end is the victor, regardless. History is replete with resounding victories won by those who held an objective while sustaining heavier losses than the enemy. Yet, I've now heard from both Roland (in game) and Pepe (post-game) suggesting that vp ownership was not all that critical to final victory. I'm fine either way and agree that it may actually change scenario to scenario. But perhaps it could/should be stated clearly in either the scenario design or pre-battle briefing if we're expected to sell-out to take and hold the vp -- or hold back or even retreat if the cost will likely run too high. I thought I was well connected to Digby's left and that his flank was never close to being "in the air." But that's what makes these games so fun: the tough decisions commanders are forced to make with limited knowledge of the battlefield. At one point early on, while I was sitting on the reverse slope enjoying not being hit by artillery (Iron Mike had moved to the crest and was taking a pounding), I received a courier from Pepe asking me to move up to the ridgeline in support. I quietly deleted the message and was ready to say I never got it. Eventually Mike pulled back a little and we waited for the French to come to us. so if you have lost 80% of your army but managed to appear at the VP 2 minutes before the 3 hours ran out - no... that should not qualify you to have won the fight. I just want to ensure that the bigger picture is not forgotten if a VP is present: just holding it when the army has been cut in half at the end of the fight - it should at least be up for serious discussion whether it still means that you won the fight - always looking at the scenario and its intentions! I understand your point, but would also argue that while it may be said (in Sunday's scenario), we would not have achieved victory even had we held the VP at the end, it is also virtually impossible to claim victory if we did not hold the VP, especially against an AI opponent. Thus, I was a bit depressed to receive the order from you to abandon the VP. Unless a Russian counter-attack was in the cards, withdrawal from the vp gave up any chance we had to win. an edit to Ron's last comment on not sending a courier to Pepe while being detached to me: I can only argue from real life military structure here: You were detached to serve under my command, thus I took full responsibilty of you and all your troops. I saw you as one of my Brigades and acted accordingly - you are at no fault for not sending messengers back to Pepe - since you kept sending a steady flow to me! I agree Roland - there can be times such as you describe when who sits on a VP may not be a true measure of who won, but your descriptions of events there - I know you're using extreme examples to make a point - hardly ever come up with our games, either stand-alone scenarios or campaign scenarios because we always have some kind of design intent behind the game. We never just throw together a sandbox scenario and go. So yes, possession of the VP(s) should always be the key win/lose factor, regardless of losses and relative positions because presumably (logic must dictate) the VP represents some overreaching vital thing to both sides whose control is why they are fighting here. We can call it a dominating height, a supply depot, a communications node or a pile of silver spoons, it doesn't really matter, what matters is its there and its important! I think we have had a few games where an objective is there merely to "focus the battle into that area", but usually they mean more than that. Mark - it was curious as I could see your brigade in the Goumont woods for a long time holding steady but as time went on the French moved inexorably further and further north until eventually they broke out of the undergrowth and reached the garden wall and the south gate. When they came into the open there I charged them with one of my three remaining (rather blown) squadrons which held them up only briefly. By then Mike was hinging back his left hand battalions and wrote me a note saying he wasn't going to last long and that battalion fell back moments later. By then I was well on my way back to the next ridge and fortunately there my two batteries and Roland's two lined up and blasted any further French advance to shreds. He and I sat on our horses quaffing an excellent burgundy and exchanged messages about how glorious it was to watch the guns do their terrible work on the Godless French. By this point your brigade Mark, was, I think on the far west slope of Wellington's ridge with Mike's tired wet-powder brigade to your right. The French had spilled around the west wall of the chateau, lapped around the north gate and were trying to get up onto the main ridge. They didn't make it but I'd had no comms from Pepe for a while by then and the Chateau and its woods cut off any view of what was going on beyond so I had no idea how dangerous the situation in the east was. As you say its this limited understanding of the bigger picture that really makes these games unique. This was one of our better ones of recent weeks, the only one more epic was "the Crater" where we annihilated the Austrians who decided to defend a bridge across a vital river in a deep hollow in the landscape and give us all the hills around it. The last 3 weekends have seen really good battles. The first two, the Austrian battle for a crucial bridge crossing and the Russian fight for Papelotte and Smohain were obvious fights for an objective. Losses didn't really matter, just holding the key points at the end of the battle and preventing any possible recapture counted. Sunday's battle was somewhat different. 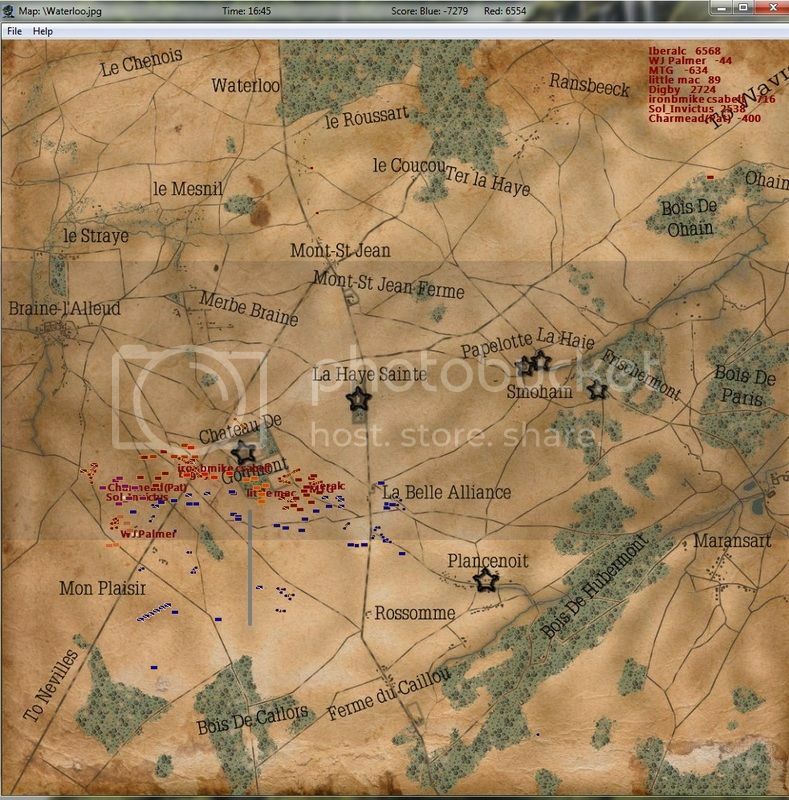 The objective was placed so the French would have decent ground to defend and it was in a place we hadn't fought over. They didn't really need the good ground, as their crushing of our left flank was all they needed to do. At best, it was a Russian pyrrhic victory. The French didn't have a viable force at the end, but ours was only a little better. I can tell you are right Roland. I will try to send more couriers in my games, specially in your case. The last courier I got from you was; "I have taken the objective. I will leave a token force there and push the French to the east." About Ron's brigade attachement, I am also of the opinion that the best thing to do is just to coordinate with the divisional commander in charge of that area and he in turn to communicate with the CinC. I didn't get any of Ron's couriers either. FYI, no cavalry reserves were available, I had just one squadron left after facing the Grenadiers a Cheval de la Garde. I really enjoyed the battle. Given that both sides were exhausted and chewed to pieces, and the Snail-Eaters were dancing the cotillion at the objective, I think there's little doubt this is a clear win for Norb's AI. The only place this gets reported as a Russian victory, pyrrhic or otherwise, is in the Tsar's press -- and then only if Alexander is feeling insecure. The only place this gets reported as a Russian victory, pyrrhic or otherwise, is in the Tsar's press -- and then only if Alexander is feeling insecure. Spoken by another birch tree census taker. I am sure Bennigsen's report tells of a great Russian victory. To say otherwise...well winter is only 9 months long up there. Dress warm.